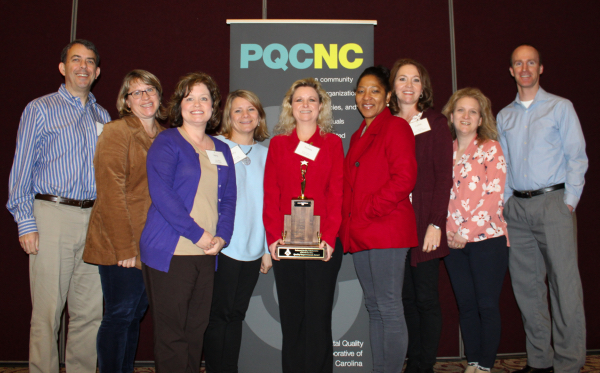 Based on the demonstration of outstanding Quality Improvement Methodology PQCNC is proud to announce the recipient of the 2018 PQCNC Quality Award: Atrium Health Cabarrus, home of the Jeff Gordon Childrens Hospital and its outstanding NICU for their project Improving Neonatal Outcomes Through Implementing an Antibiotic Stewardship Program. The team demonstrated exemplary planning, implementation, and ability to spread and sustain its quality improvement (QI) effort designed to decrease by 20% the continued use of antibiotics in NICU infants after negative blood cultures. Through tireless education efforts, inclusion of all key stakeholders in their stewardship team, the execution of successful PDSA cycles that included hard stops for antibiotic orders and introduction of the Kaiser sepsis calculator, the Stewardship Team was able to reduce the rate of antibiotic continuation in the face of negative cultures from 25% to a sustained rate of 0% over the last four months of the Antibiotic Stewardship Initiative. They reported noted no need to restart antibiotics acutely in any babies as a result of their interventions. The NICU team has since spread efforts into the Newborn Nursery. The Newborn team has adopted the same outcome measures that PQCNC ASNS utilized and is in process of collecting data since their May 1 Go Live. After performing a cost analysis for obtaining a complete blood count with differential, blood culture, starting an intravenous line, four doses of ampicillin and two doses of gentamicin each newborn in the program has resulted in a cost savings of $284, not including possible NICU transfer. Congratulations to the team for your fine work and your commitment to making North Carolina the best place to give birth and be born!